December 22 will be our last day of regular classes before the Holidays. Classes will resume January 7th. Weather, Class Cancellations: When in doubt contact the school 416 897 9750. If classes are cancelled due to bad weather, the answering machine will be updated. PLEASE contact the school if your child will be absent or running late.You can call, text or send us an e-mail. Thank you! CECCHETTI DAY WORKSHOP (for Grade 1 and 3) will be February 26 at The National Ballet School. Please contact Ms. Sue for details. We are still accepting new registrations… class size is capped at 8, a new class will be added to the schedule if there are more than 8 kids in one class. Students are encouraged to try out other classes. We are offering Mini Jazz this year for ages 6 – 8, Thursdays at 5:45pm. 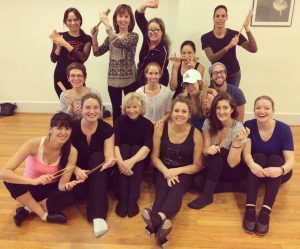 FLAMENCO & BASIC SALSA will be adding an evening class! Thursdays at 6:30pm. This is a super fun class 🙂 I hear Valentina speaks Spanish half the time when she’s teaching, so it’s like 2 lessons in 1, you get to learn to dance and speak Spanish!! ADULT JAZZ Monday nights at 8pm with Ms.Kyra! Is there such thing as too much fun? Jazz shoes available at Mara’s, 2189 queen street. Oh and we’re on instagram. And we are back! To blogging that is… after a long break, we thought you might be wondering about us. We held 3 summer dance camps this year, 1 in July and 2 in August. Kids had the opportunity to work with guest teachers and learned different disciplines, such as Acro and Musical Theatre. Thank you Ms.Katherine and Ms.Murphy for joining us this summer. 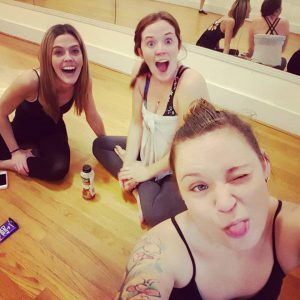 BRING A FRIEND FOR A FREE TRIAL CLASS THIS OCTOBER! DROP OFF / PICK UP ~ Due to the high traffic during beginning and end of classes, parents are encouraged to leave their strollers outside of the studio. It is important for our dancers who are in class to not lose their focus due to noise level in the waiting area. If you are going to be late, please contact the school. Also please let us know who will be picking up your child. SHOES~ Street shoes are not permitted in the studio (both floors). Everyone must take their shoes off and place their shoes in the shoe cubby, located beside the entrance. This is the only way we can keep our studio clean and safe for dancing. Please help keep dirt, grit, sand and wet puddles on rainy days off and away from our dance school. Also Ballet Shoes should not be worn as street shoes, these shoes are specially designed for dancing and they’re made for dance floors. Please help us teach our future dancers to respect their dance attire. Thank you kindly for your cooperation. BLUE BIN is our Shoe and Attire exchange bin. It is not the lost and found, please only leave dance attire . You can exchange shoes and clothes in good condition anytime. We also accept dance related books. Thank you to the little ones that participated in our March Break Dance Camp this year. We all had a great time dancing, playing and making neat things… we look forward to having you back for Summer Dance Camps. We have now entered our 3rd and last Term for this dance year. Students are now starting to learn and practice their year end recital dances. Indeed a very exciting time for everyone. Some classes may have extra practices, please read e-mails and newsletters carefully. If you’d like to register for Summer School Dance Camps, please send us an e-mail. August dates are filling up fast. Please reserve your spot early, by sending us the registration form and fees. I am delighted to welcome Valentina as our new Flamenco & Salsa instructor, Amanda for Zumba more details coming soon…Martial Arts with Sensei Bill, Music lessons with Toni, Belly Dancing with Tarub and the lovely Eileen for Yoga. Join us for any of the above classes 🙂 Fun, Friendly and sizzling hot! We have added new classes to our schedule for the new year, including Adult dance classes (Flamenco, Belly Dancing, Fitness and Martial Arts). We still have room for children’s classes, contact the school for Winter Term registrations. Looking forward to dancing with you in the new year! Due to high traffic during beginning and end of classes, parents are encouraged to leave their strollers outside of the studio. It is important for our dancers who are in class to not lose their focus due to noise level in the waiting area. If you are going to be late, please contact the school. Also please let us know who will be picking up your child. All students are required to bring post-dated cheques. This secures your child’s spot for the whole year and also helps office administration run smoother. NSF cheques are subject to a $45 charge. Registration fees are non refundable. Contact BDS for more info and reserve your spot early! Our classes have started. Please check our schedule as we have made some changes to the Thursday classes, our Junior Jazz class is at 4:45pm and Junior Hip Hop is at 5:45pm. I apologize for the changes… on a rare occasion schedule changes happen, especially in the beginning of the year. I hope that this schedule will accommodate everyone. We say goodbye to Ms.Emily and wish her all the best in her future endeavours… she will be much missed by her students, parents and staff at BDS. We also say goodbye to our beloved Ms.Michelle at the front desk. She is also much missed by everyone. We wish her all the best in her new job / career as a support worker. We welcome Ms. Kalicia as our new junior Ballet teacher on Saturday mornings. We also welcome Ms. Carolyn as the new office administrator. Welcome back Ms.Kyra, she will be teaching our *new mini Jazz and Tap class at 4pm on Thursdays, as well as all the other Jazz and Hip Hop classes. Sadly all our summer camps are now over… Thank you to all that participated, it was lovely to meet you and dance with you all. We also welcome Ms.Amber to BDS. Camp kids will be happy to hear that Ms.Amber will be teaching our Monday regular classes, this fall. We are delighted to have her on board. Check our schedule for updates. Fall registrations are open. Please e-mail – info@beachdanceschool.com for more info. 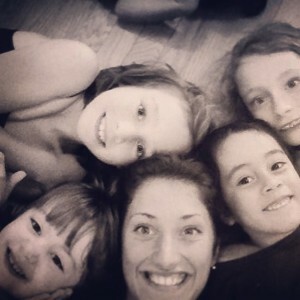 Dance Camp – Aug 10th and Aug. 17th – if you are looking for last minute activities for your young ones, look no further! We have room. Contact info@beachdanceschool.com.